Can you believe it’s been over 5 months since I launched Adventures with Nell?! It took about two years of saying that I wanted to start a blog to actually give it a go, mainly because I didn’t know how to set it up, maintain it or what the hell I’d actually write about. In other words, I was scared to do something that I had no idea how to do. To be completely honest I still have no idea what I’m doing, but I’m enjoying the steep learning curve and hugely excited to continue to develop my skills and my writing style. I honestly can’t believe how many new skills I’ve gained in the past few months. I’ve taught myself how to use WordPress, SEO, Pinterest, LightRoom, Google Analytics and hashtags. I’ve learnt how to actually set up a blog, and what a hosting site is! I’ve learnt what affiliate links are. I even know what a meta tag is! I’m taking better pictures and have an interest in photography for the first time, and I’m certainly finding my own writing style. There is so much more to learn, but I’m proud of what I’ve achieved so far! I never imagined that writing would be so therapeutic – it serves as the perfect escape from the rest of life. I know that as soon as I sit down to start working on a blog post I will become completely absorbed in writing and any stress or worries will instantly melt away. Blogging gives me a sense of achievement, and I feel proud when I see people are reading things that I’ve taken the time to write. Blogging means that I never feel bored or lonely, because if I’m at a loose end I can write! 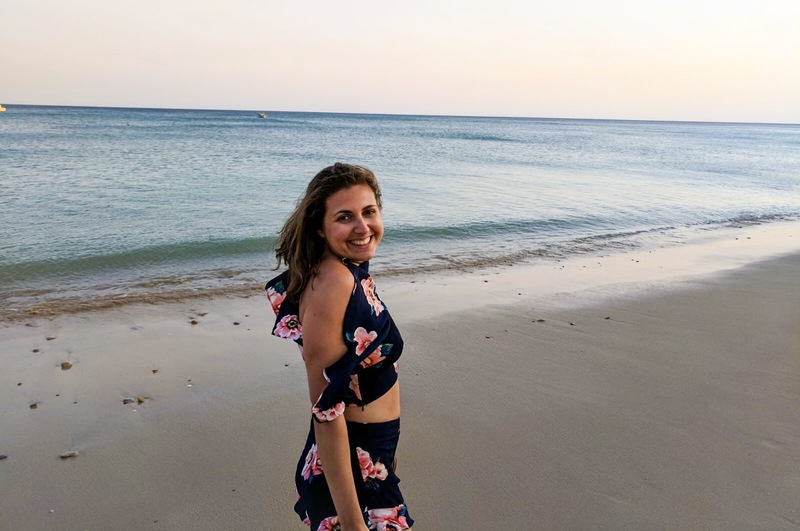 Blogging gives me the opportunity to connect with others: when I posted Coping with Mental Health Abroad, so many people not only complimented me on my writing but also opened up to me about similar experiences they have had. In short, blogging makes me really, really happy. On the other hand, there have been a few times that blogging has increased my anxiety. I have a full time job that often requires working long hours, and a particularly busy period recently has meant that I’ve not had a much time to work on my blog. I know I can’t do everything and that there will be peaks and troughs, but I do find myself feeling guilty (and in turn anxious) about the things I should be doing, whether that’s posting more blog content, pinning graphics to Pinterest or increasing my social media engagement. Social media seems to be an area of unease for a lot of people. About a year ago I took a break from posting on Instagram because I felt like it was stopping me from experiencing life in full – I was thinking about taking pictures for the ‘gram instead of enjoying the moment. And whilst I was able to see Instagram as a highlights reel rather than an accurate depiction of everyday life, not everyone can and I didn’t want to be a part of this. Now I’m back on Instagram so that I can promote my blog, but I always put my enjoyment ahead of worrying what I’m going to post, and I take pictures but wait until after the event to upload. My Instagram feed will always be a place for me to share fun moments with friends and family, rather than over-filtered or over-considered… but that’s not to say that I don’t enjoy looking at other people’s beautiful and thoroughly thought through feeds. I’ve also recently discovered Twitter and Pinterest (I appreciate Pinterest isn’t strictly a social media platform) which I’m really enjoying. Twitter in particular can often feel like a really supportive and genuine platform! There are so many things that I want to write about! I’d love to write about fashion and beauty, but I have no knowledge in these areas or much of a sense of style. I’d love to write about positivity, mindfulness and slow living but I need to master these myself first! I wouldn’t mind writing about books either, but I don’t have time or read fast enough to get through the number of books I’d need to read to be able to write about them. I’ve read a lot about niches and to what extent you should stick to one, and in a dream world I would have travel as my niche. However, with limited annual leave and limited budget I would struggle to have enough content. I’m passionate about food and about the city that I live in, so these feel like the natural subjects to write about between my travel posts. But sometimes I just want to get my thoughts down on paper (well, laptop) in a post like this one. Is that ok, or do I need more focus? I guess I’ll have to wait and find out, but in the mean time I’ll continue to blog for enjoyment and write what I feel like. My reason for starting a blog was purely as a hobby… something to fill my time whilst improving my writing and giving me an excuse to go on more holidays and eat at more restaurants. Maybe I’d get a free meal one day in turn for a review or get invited to an exciting event. What I didn’t know was that blogging can be a career in itself! I’m nowhere near that – I’m only five months in after all – but it’s been so inspiring to discover bloggers who have turned their passion into a business and made a living through hard work and dedication to their blogs. I’m building up the courage to start pitching to brands (I probably need a few more blog subscribers and Instagram followers first, hint hint) and who knows, maybe one day that will be me too! My impression of blogging was that it’s very much an individual hobby… how wrong I was! The blogging community is supportive and inspiring, rather than in any way competitive, which is surprising when a lot of bloggers will be going after the same paid opportunities. I’ve engaged with loads of great bloggers on social media, I met new people when I attended a blogging workshop with Blog & Beyond, and I’ve become closer with my existing friends who also have blogs. I’d love to attend more blogger events and workshops, so please do let me know of any coming up around Leeds! These are of course just a few of the things I’ve learnt so far, and I’m sure I’ll be writing a similar post in a few months time with even more lessons. I’d love to hear what you’ve learned from blogging, whether you’re a newbie like me or have been doing it for years. What I love most about your style is your frank and honest, and are willing to share what you feel about things. Don’t ever let this change! Thanks Marianne! Definitely won’t let that change, no point in writing if I can’t be honest in what I’m sharing.